Tropical Depression Sanvu has strengthened into a tropical storm in the Northwestern Pacific Ocean and NASA's Aqua satellite gathered temperature data on the storm's cloud tops using infrared light. 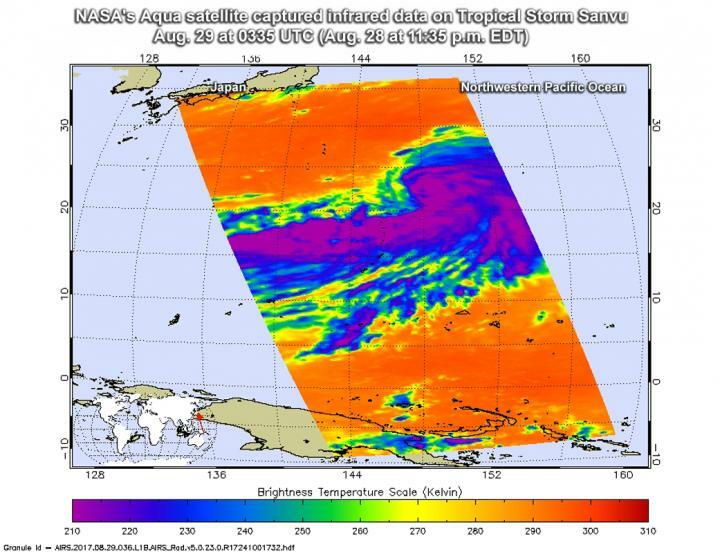 The Atmospheric Infrared or AIRS instrument aboard NASA's Aqua satellite captured infrared data on Tropical Storm Sanvu Aug. 29 at 0335 UTC (Aug. 28 at 11:35 p.m. EDT). Infrared data provides temperature information to scientists. Cloud top temperatures are an important factor when it comes to determining the strength of storms. The higher the cloud tops, the colder and the stronger the storms. At 11 a.m. EDT (1500 UTC) on Aug. 28 the center of Sanvu was located near 24.4 degrees north latitude and 146.5 degrees east longitude. That puts Sanvu's center about 315 nautical miles east of Iwo To Island, Japan. Maximum sustained winds were near 45 knots (51.7 mph/83.3 kph). Sanvu was moving to the north-northwest at 15 knots (17.2 mph/27.7 kph).